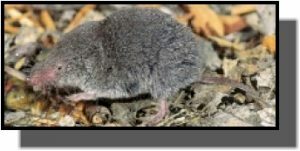 Comments: Least shrews are the smallest mammals in Kansas and are grayish-brown in color. They have a long, pointed, flexible snout, jaws with 30 teeth, small, beady eyes, small ears and a short tail. Most shrews are solitary but some least shrew nests have been found occupied by several adults of both sexes. Females bear up to three litters with 4-6 young each from March to November. Their maximum lifespan is 18 months. Distribution: Least shrews range from South America through the eastern half of the United States. In Kansas, they are found in grasslands, shrublands, woodlands and wetlands. Food: Least shrews feed primarily on insects, snails and earthworms and consume 60 to 100 percent of their body weight each day.